Following the BAFTA award-winning Channel 4 series ‘All in the Best Possible Taste with Grayson Perry’ BM&G is the first Midlands venue to display the series of six tapestries that were produced alongside the programme. ‘The Vanity of Small Differences’ by the Turner Prize-winning artist comprised of a series of six large tapestries (2m x 4m) which tell the story of class mobility and the influence social class has on our aesthetic taste. 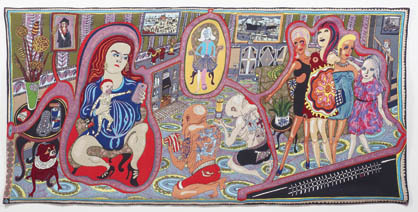 Inspired by William Hogarth’s A Rake’s Progress, the six tapestries chart the “class journey” made by the fictional Tim Rakewell and include many of the characters, incidents and objects that Grayson Perry encountered on his own journeys through Sunderland, Tunbridge Wells and the Cotswolds for the television series. In the television series Perry went “on a safari amongst the taste tribes of Britain”, to gather inspiration for his artwork, literally weaving the characters he meets into a narrative, with an attention to the minutiae of contemporary taste every bit as acute as that in Hogarth’s 18th century artworks. This entry was posted in Art, Birmingham, Exhibitions and tagged Art in Birmingham, Birmingham Museum Art & Gallery, BM_AG, Exhibitions, Grayson Perry, Grayson Perry Tapestries. Bookmark the permalink.